Although the 2019 Kentucky Derby is still almost four months away, it's not too early to look at the current set of qualifying horses and upcoming Kentucky Derby Prep, Championships Series, and Wild Card Races. 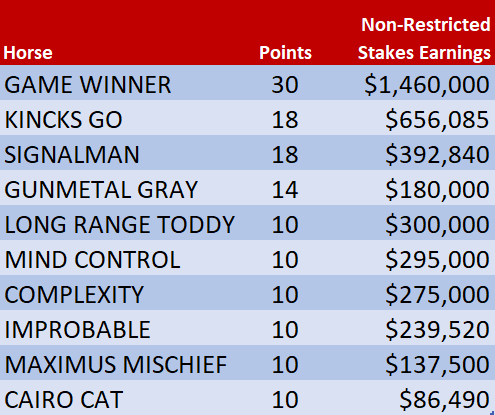 Here are top 10 qualifying horses for the 2019 Kentucky Derby, as of January 12, 2019. GAME WINNER might have enough points without running another race. Last year's 20th place qualifier and fourth place Kentucky Derby runner, INSTILLED REGARD, ended with 29 points. Of course, the standings will change between now and the first Saturday in May when up to 20 horses stampede out of the gates, bump, bobble, and race around Churchill Downs. How, you might ask yourself, are the 20 entrants determined? A tiered point system is used to select which horses qualify to run in one America's greatest races. To run for the roses, horses travel along The Road to the Kentucky Derby. It starts with the Kentucky Derby Prep races. It a series of 19 horse races where the winner is assigned 10 points, 4 points for second, 2 points for third, and 1 point for fourth. The Breeders' Cup Juvenile is an exception as the points are doubled to 20, 8, 4, 2. Eight races remain in the Kentucky Derby prep season. The Kentucky Derby Championship Series of races is broken into two legs. The first round offers 50 points to the winner, 20 points for second, 10 points for third, and 5 points for fourth. Here is the schedule for the first leg. Points accumulate quickly in the second leg of the Kentucky Derby Championship Series. Winners get 100 points, 40 points to place, 20 points for show, and 10 to fill out the superfecta. Winning one of these remaining six races can be enough to qualify the horse for the Kentucky Derby. Last year's Kentucky Derby winner and Triple Crown Champion, JUSTIFY, had exactly 100 qualifying points. Here is the remaining second leg schedule. Finally, there are two wild-card races where 20 points are assigned for first place, 8 points for the runner-up, 4 points for third, and 2 points to come home fourth. These are the wild card races. Churchill Downs introduced the "Japan Road to the Kentucky Derby" and a "European Road to the Kentucky Derby" to provide potential, international entries into the Kentucky Derby field. When all the roads to the 2019 Kentucky Derby have been travelled and the points added up, the 20 horses with the most points will have their chance to run for the roses on Saturday, May 4, 2019. Of course, we'll cover, analyze, make selections and provide commentary for all the races on The Road to the 2019 Kentucky Derby.